What is more beautiful, more eye-catching, or more appealing than gorgeous granite countertops Dallas? So many homeowners today choose to install granite somewhere in their home, most often in the kitchen where it can be admired by all. Granite countertops, in recent years, have become a staple in homes everywhere. Once used by the people of the ancient world, who quarried granite in order to build monuments, temples, and other edifices, it is still a highly sought after stone. Because of granite’s status as a beautiful and quality stone, it has been regarded as a material only for those who can afford its hefty price tag. Yet adding granite into your home does not require an exceptionally high budget — you simply need to consider alternative options. Granite remnants are the perfect solution for those seeking a way to work granite countertops, vanities, or even decorative accents into a home remodel without bursting their budget. Granite slab remnants are so affordable that any homeowner can take advantage of their beauty and benefits. It has become a popular choice in home remodels, updates, and upgrades because it is such a versatile and durable material. There are so many different options for this natural stone: color, pattern, thickness, and even level of shine. It is that attractiveness that makes it the first option for so many — granite comes in so many beautiful blends of color that it is possible to find a variety that suits any kitchen, any bathroom, and any room of the home. No manmade material can mimic the gorgeousness of granite countertops in Dallas, and the process by which granite is created in its natural environments is impressive as well. The product of volcanic lava and magma, granite slabs begin to form once these incredibly hot liquids cool into a solid rock. Crystals within begin to grow, combining the lava with minerals and growing right into one another to form an interwoven inner structure. These bonded crystals give granite its rock-hard strength — as well as making it one of the hardest materials known on Earth. 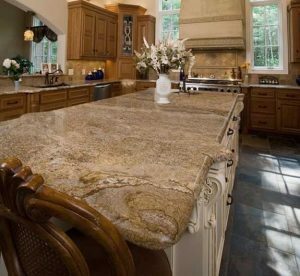 Although granite initially earned its reputation as the must-have home remodel addition for counters, tables, and backsplashes, it is a stone that needs little upkeep or repair over the years. Granite is notoriously hardy, able to withstand great stress and wear and tear. In fact, if you cut food or other items right upon a granite surface, you will do no damage at all to the stone itself; the cutting implement, however, will grow dull quickly. Want to buy the premium-grade granite countertops? Call us now at Hard Rock Imports. We offer these top-notch granite countertops at affordable rates. Give us a call for a free design estimate!